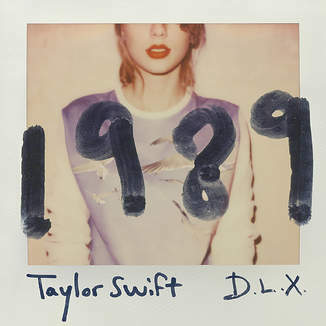 Guess who’s really late to the ‘1989’ party? I was a fan of Taylor Swift years and years ago when ‘Love Story’ came out – Speak Now was a great album. But I went off her when she started naming the people she wrote songs about – I didn’t care that she wrote songs about real life experiences, I write stories about real life experiences – I just thought it was cruel that she named people. I’m not going to pretend I always liked her because I didn’t and I’m not one of those fans. But then I heard Shake It Off. Shake It Off changed everything. At first I refused to like it but it was played so much and it was so catchy that I couldn’t help it – I realised how fun she was. I saw her on Graham Norton and realised how painfully alike we were – if I was ever famous, she’s the kind of celebrity I’d like to be. Last week I finally got round to copying ‘1989’ from my sister’s iTunes (I can’t afford it and she’d already bought it!) and I can’t get over this album. It’s so much more mature than the other albums I’ve listened to. I love the pop/electric dance elements that she’s integrated with her core sound – developing yet staying true to herself, which is the best kind of growth for a musician I think. I think she’s a very clever writer, especially with her beautifully written lyrics. If you’ve read any of my music related blog posts (there’s a lot of them, oops) then you know I’m a sucker for lyrics. I know this is an album I’m going to be listening to a lot this summer. Oh my god, this post is honestly the exact same way I felt/feel about her! I love 1989 so much and I didn't want to like it at first but now I cannot stop jamming to it. I didn't like Taylor much anymore when she started naming people but I realize now that she is such a wonderful and clever person and now I love her and her music again.